found this guy with no head in the dryer and will be posing him around the house. 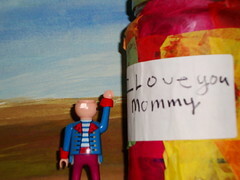 My son made this fortune jar in 3rd grade it contains sayings of things he loves about me. I love it. Love is the Revolution.